Home / Hardy Geraniums / Welcome home Granddad! Well after being lost for many years, I finally have grandad back with me! No he didn’t go wondering around the world and got lost on some great adventure in the middle of the Himalayas or to darkest Peru but he is indeed a plant I named after my grandad. 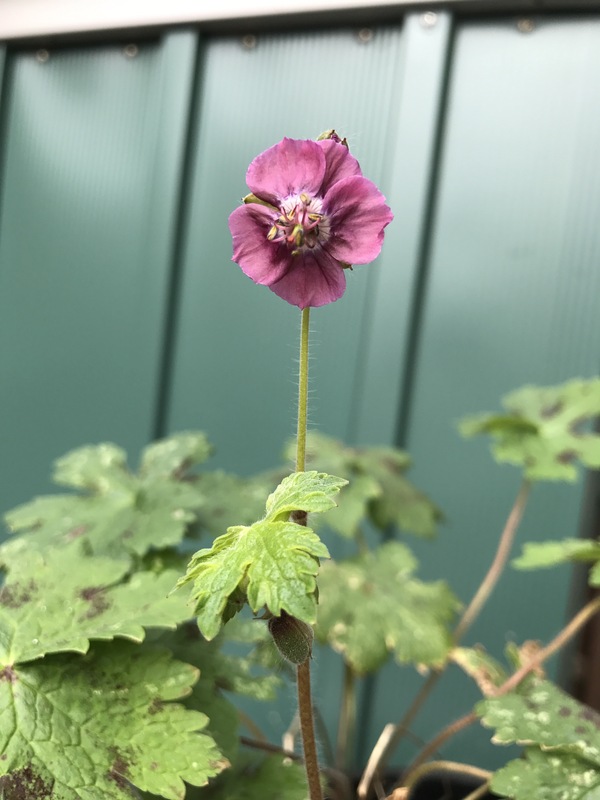 It grew well in my Hampshire home and it was divided up and used in a plant swap in a well know geranium nursery in Norfolk, went on trail at the RHS Geranium trails at Wisley gardens as well. In 2006, for various reasons, I moved to West Sussex for a new job that only sadly lasted for year and with the constant moving, being homeless etc, I managed to loss all my geraniums, every single one, I was gutted. It took me many years before I was settled again and my love of plants was set on fire again once more and I wanted my grandad back again with me at home. Sadly for some reason the Norfolk nursery failed to answer my emails, tweets and messages as to whether they still had it despite it being listed on plant finder with them. It really really upset me thinking I may never get the plant back again. Thankfully in 2017, a new supplier was listed in the plant finder, Gardener’s Cottage plants, a quick email and then a chat with the lovely Andrew Davenport, talking as all gardeners do, about plants, gardens and all things garden related, he did say he had one plant left! It just made my year! Soon after, the plant arrived home and now it’s settled in nicely back with me and just started to flower once more. This time I am going to build my stocks up, supply to a lot of others to have in their gardens and this time I will not lose my Grandad! What a wonderful story and, without wanting to seem sycophantic, what a beautiful flower. The colour seems far more consistent across the bloom than, say, “Rose Madder” and I like the shape of it too. I haven’t seen markings like those on a leaf since the last time a rose got a touch of black spot! Icing on the cake. Your pride in that plant is totally justified. Thank you so much John, it’s great to have someone else echo my thoughts on him 😀 seen a few reds and not close to him, hopefully will propagate next year and won’t lose him again! A lovely story and as John says a wonderful flower. It is very odd as I am just in the middle of writing about my naming of a plant. We must be synchronised! Thank you Lou 😀we do don’t we? Unless we are very lucky, our jobs generally mean if we want to move on up or see another job that we really fancy, we have to move sadly and plants don’t like that movement do they, l hope you start regaining some of your primulas not far from a brilliant primula nursery are you? I have 2 replacements now a double & a striped, which nursery?? What a lovely story. I think plants mean so much more when we link them to a person. The name ‘Grandad’ is so sweet. I would love to have him in my garden too.